Training Doctors from Papua New Guinea! Papua New Guinea: For the past 5+ years, Imelda has been working side by side with us in her Masters of Rural Registry Program. 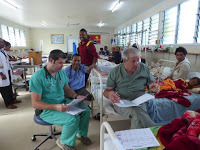 The Masters in Rural Registry Program is a 6-year program that seeks to train the PNG doctor to be able to go out to a Rural District Hospital in PNG and care for the needs of the community and hospital. They get training in Administration, Xray, Surgery, OB, Peds, Medicine, Anesthesia, Solar Installation and everything in between. Mel is in her last year with us and it has been a joy and pleasure to see her grow during her time with us. We don’t know what the future holds for her and her husband, but would love to see them continue to serve and work with us. Part of the Rural Registry program is to have surgical training, which occurs through 3 surgery rotations for 3 months at a time, over 3 years. Imelda did her rotations away from us, getting training from other surgeons in PNG, but other Rural Registrars come to Kudjip to get their surgical training with our surgeons. We have had a number through the years and this year have had three. Winis, is the one with us currently and has been with us for almost 3 months now, working with Drs. Ben and Jim in surgery. I have done a few C-Sections with him and know he has learned a lot and will be a great doctor for the Telefomin hospital and patients he will serve. 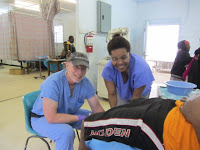 We also had a PNG medical student working with our Surgeons over his Christmas break. Glenn grew up here, his mom works for us, and he is in his 5th year of Medical School in PNG. He hopes to become a surgeon and thus is trying to learn all he can while he can. We hope to continue to be a place for training of PNG doctors – surgeons, rural registrars, and medical students, with the hope that some will stay with us and serve with us and some will be called to go out and serve in other parts of Papua New Guinea, improving the health care of the country. We are scheduled to start having regular PNG medical students rotate with us later this year. It is exciting to see what might come of being more focused on training PNG doctors.